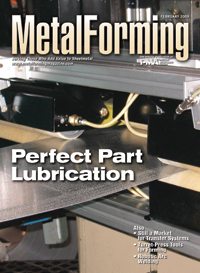 A dramatic shift in stock-lubrication strategy for deep drawing and stamping at an MTD facility yielded improvements in press uptime and operator efficiency, and slashed lube consumption as well. Roll coaters can apply wet or dry lubricant, in the right amount, to flat stock of any thickness and width, without overspray or other negatives typically associated with lubrication. Interested in a Servo Transfer? Then check out these pros and cons of two common types: through-the-window and front-and-back-mounted. New software lets this Wisconsin fabricator cut robot programming time and achieve a new level of welding accuracy. Metalformers operating CNC turret punch presses can apply tooling innovations to bend flanges, form spot-weld locating features, debur and hem. Finished parts emerge in one material handling, pushing productivity to new heights and putting a choke-hold on rising costs. Can Alloys Exhibit Superplastic Forming?